Looking for a quick answer? Click here to compare 63 pet insurance plans. If you want to know more about how to choose and what to look for in pet insurance, keep reading right here. There’s a big problem that you will already know if you’ve tried to insure your dog or cat. There are 20 or more insurance companies, all with different policies, conditions, costs, limits and excesses. If it isn’t already hard enough, many high ranking pet insurance review or comparison sites accept payments from the very companies they review. Here are quotes from three leading sites. How do you decide which one is best for your pet? If you’re not even sure you want insurance, visit this page to find out the benefits of pet cover. Finally, reimbursing you for the percent coverage you have selected. Read my views on these choices below. Don’t forget that there are many more plans and this only applies to the ones I’ve reviewed. The excess is the amount you pay before insurance starts. A low excess will be good for frequent vet visits, whereas a high excess will mean many simple visits aren’t worth claiming but your premium will be cheaper. I personally would choose a high excess as (for me) it’s only the big stuff I need to insure against. I used to think $10,000 was enough until I saw a dog reach a $15,000 limit after a week in intensive care. My advice is to go as high as you can afford, but $12K is usually safe. Honestly, I wouldn’t waste my time with an accident-only cover. What they call an accident is so carefully stated that most of the reasons you will actually need a vet aren’t included. However, I’ve included some in the chart. What is very cool (in my opinion) is illness-only cover for indoor cats. These guys really don’t get in many accidents so it makes sense. The amount you pay is a co-payment. Only PetPlan offer 100% cover, and only up to 4-8 years of age depending on the breed. 80% cover leaves you to pay 20% of the bill and is fairly standard. This is of dubious benefit, but if you want it, great. If you look at what is paid out versus the extra you pay for it, it’s hard to make it pay its way. Of these plans, only Prosure Platinum and Woolworths Comprehensive Cover have Routine Care included as standard. For us in South Australia, paralysis tick cover is unnecessary, and in fact it would be nice to remove it completely from our plans. For the eastern states, pay particular attention to the limits if you live in a paralysis tick-prone area such as near bushland. This one’s very important if you have a dog over 15-20kg. For larger dogs, better surgical techniques for cruciate surgery have dramatically increased the price of repair, and insurance companies have tried to limit their losses. Only PetPlan offer enough to choose a specialist surgeon, but a limit of $2600 + copayment should be enough for TPLO surgery in a clinic like ours. Cats almost never have cruciate ligament problems. Don’t forget to get your vet to fill out a Cruciate Ligament Exam Form when you start dog cover so you don’t have a 6-month waiting period for claims. I’m not happy about the new $300 limit for consultation fees (that’s only five a year), but all except PetPlan do it. After you’ve spent the $300, you’ll still be able to claim medicines and eligible procedures, but not the visit fee itself. Bupa also have a sublimit of $500 for skin conditions: worth avoiding for owners of breeds prone to dermatitis. All the companies are much the same here in offering boarding if you need to go into hospital for more than four days. Only Seniors and Petinsurance.com.au state that they will cover home visits with no obvious conditions. Other companies may still cover them, but only at the level of fees charged as if the animal attended the vet. Of these companies, only PetPlan, HCF, Prosure, Prime and Bupa cover dentistry and other oral diseases (other than a small contribution in Routine Care options). In order to claim dental work, you must have had your dog’s mouth examined by a vet in the previous twelve months and also followed the vet’s treatment advice. HCF, Bupa, Prime and Prosure won’t cover for orthodontic treatment, crowns, root canal or corrective treatment. They also don’t cover odontoclastic resorptive lesions, making this cover poor value for cats. There are 6 month (Bupa) and 2 year (HCF, Prosure & Prime) waiting periods from the start of cover during which no dental problems can be found. With most pet insurance, illness cover needs to start before 8 or 9 years of age to be continued for life. Exceptions are PetMed who offer a Seniors Plan with 65% cover and three benefit limits, and Woolworths Basic Cover. On the other hand, accident-only cover tends to not have a cutoff. PetPlan and Bupa Ultimate cover alternative therapy up to certain limits. Bupa require all treatment to be administered by, or referred by a Vet. PetPlan say much the same, plus their own recognised organisations. Again, only Petplan provide any cover for damages arising from such things as dog attacks, or dogs causing motor accidents. The fine print is complex but the essence is that you can’t take no responsibility for your dog and expect to be covered. Third party liability may be very handy in some circumstances. 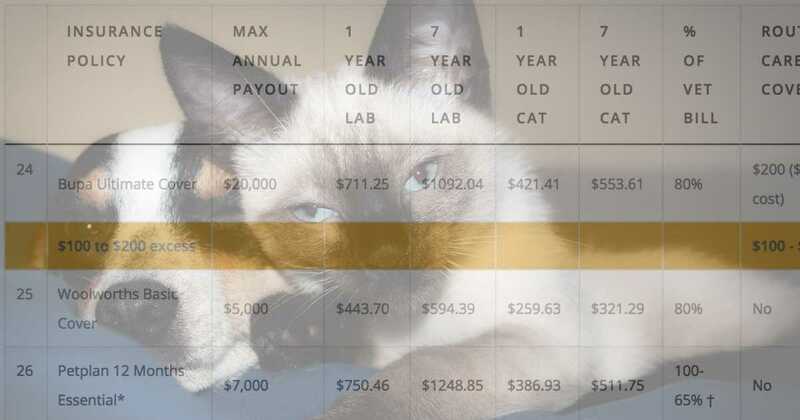 I’ve priced 63 policies for dogs and cats of different ages and placed them in order of excess and maximum annual payout (i.e. not by merit). It’s now up to you to find the policy that suits you for price and performance. I’m too busy to update this page more than once a year, so it’s never going to be 100% accurate. It’s only a guide and you need to check these figures and conditions yourself before purchasing insurance. * Some companies allow a waiver after 18 months if the problem does not recur, but this is entirely at their discretion. If a problem appears after starting insurance, it should continue to be covered for life up to the maximum payout. We’d like to thank Max for his help. By Andrew Spanner BVSc(Hons) MVetStud, a vet in Adelaide, Australia. This page is from a series regularly posted on Facebook. Like or follow our page to read the latest.